The Black Box, photo by Luke Fowler. Please join us for an evening of live improvised electronics by Luke Fowler, Sarah Davachi, and Joshua Stevenson, presented in partnership with Western Front. This performance emerges from research by Luke Fowler into the life and work of composer and musician Martin Bartlett. 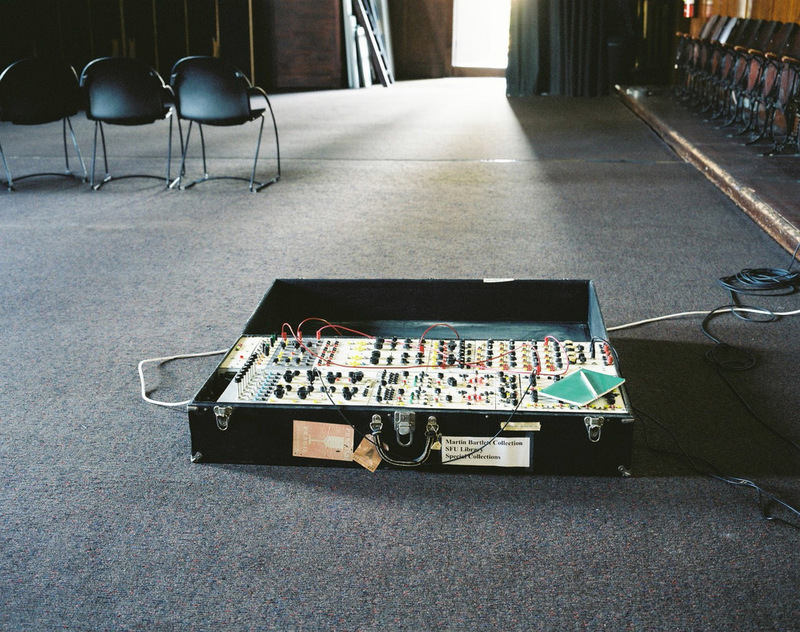 A founding member of the Western Front, Bartlett's interest in music as a social and performance tradition informed his development of live electronics. One of Bartlett's most notorious creations was the Black Box, a hand-made modular synthesizer built from circuits designed by Bill Hearn and Bartlett from parts sourced from military surplus stores in California that he was introduced to by David Tudor and Anthony Gnazzo, whilst studying electronic music (with Pauline Oliveros) at Mills College. This unique performance by Fowler, Davachi and Stevenson will resurrect the Black Box; exploring its raw idiosyncrasies within a series of different configurations and settings. Luke Fowler is an artist, filmmaker and musician based in Glasgow. He has performed with Richard Youngs, Mika Vainio, Lee Patterson and Rhodri Davies and many others. He runs the label SHADAZZ and has been experimenting with computers, synthesizers, tapes and self-made instruments since the 1990s. Fowler was awarded the inaugural Derek Jarman Award in 2008 and was shortlisted for the Turner Prize in 2012. Sarah Davachi is a composer of electronic and electroacoustic music engaged in practices of analog and modular synthesis, psychoacoustic manipulations, multi-channel sound diffusion, and studio composition. Her compositional projects are concerned with disclosing the antiquated instruments and forgotten sonics of a bygone era. Joshua Stevenson is a musician, producer, and engineer. He runs Otic Sound studio and the label Cast Exotic Archives. Working mostly with vintage EMS synthesizer's, Fuzz Guitar, Synth Bass and modified tape echo units, he plays solo under the name Magneticring and performs with the group Von Bingen.